Sziget Festival, what to do, how to move, let's discover and plan Sziget 2019! So, coming back to our topic. Finally we memorised the word Sziget, so we’re ready to a new word: köszönöm (long way to say thank you, but usually you just say köszy). Even though you pronunciation is quite similar to a gorilla trying to speak French, Hungarians are really polite. Actually, most of the time they just look at me and they ignore any of my attempt with typical Eastern European noncalanche. From one polite smile to the other, we finally got to the final choice. How we are gonna reach the famous Sziget? Honestly, when they told me that we can reach the island with a train I was thinking it was a joke. I mean, my idea of island is still romantic. Mostly, a place you can reach only by boat, small old planes or a kayak (or with magic dust, but it’s not the case). As a result, when we had to choose between train and boat, we opt for the second option, and we didn’t regret. Some breeze, when is the hottest day of the year in Hungary, is always welcome. The advice is to arrive at least 15 mins before departure. We arrived and in few minutes the line was a km. And you have to wait under the sun for the next one, not the best experience. You can pick the boat on Jászai Mari tér Pier to the Óbuda Island every 15 minutes. Luckily we did it. We paid for the boat ticket and we start our journey. The ride is only 20 minutes, but before we can recognise the shape of the island, some people finished 3 liters of beer on board. Sziget is also that. If you really want to, you can get wasted. Welcome to Sziget! The staff speaks a good English and is really helpful. 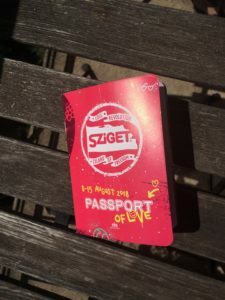 We went to a kiosk and in few minutes we had our Sziget passport of love! Next step, they give us the Sziget pass to put in our wrist. Advice: put some money directly in the pass. We top up 20000 forint (around 60 euros) and it was enough. You need to drink! Speaking about drinks, our advice is to go for wines. There are great white wines and you’re sure there’s alcohol inside. We took a Cuba libre and it was plain Pepsi,so… wine. Definetely. First, it’s shocking to see so many people there. Staff told us this 2018 Sziget is going to reach 500000 visitors. It’s just unbelievable! Anyways, it’s true, you can see so many people in so many different stages at the same time, all night and all day long. Sincerely, there are so many different shows you have just to miss some to appreciate the next. Such a high quality and good vibes, omg. 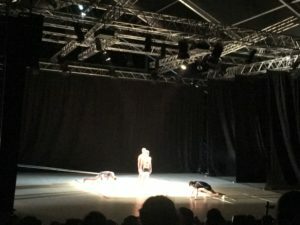 We had the luck to get to the tent Fidelio in which the group Danza del Alma was performing their dance show, Donde. We were amazed by this guys moving all together, with a drum and bass music. That was amazing, and only the beginning! In Sziget you have performances tents and stages. The stages are from huge to minimal (as the music box, where a band was still performing at 3 in the morning). We decided to attend Bonobo’s performance (stunning) and Gorillaz, but we missed so many others whose were performing at the same time. The Sziget festival is every year on the second week of August, just don’t miss the chance to see what we told you and some more. This amazing city and island are just waiting to shock you! Wow,I heard smth about this festival but now want to see it even more!